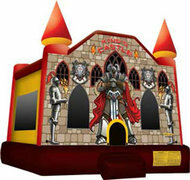 Description: It's never been so fun as with the King's Castle Bounce House. This castle is the perfect selection for a party of knights in shining armor, dazzling princesses, Harry Potter fans, and all other kids who love to have fun! The jumper features a mesh sunscreen ceiling that covers the entire unit, extra head-room for jumping due to the arched ceiling, easy-access entrance, large netted windows on the rear for easy supervision, and detailed graphics.